1. Dorothy Hinshaw substituted as Recording Clerk in the absence of Susan Rice. 2. Ron Turcotte reported for Ministry and Counsel: a clearness committee for Liana Thompson Knight has met and recommended that she apply to the “Center for Courage and Renewal” founded by Parker Palmer and others, to be trained in their “Facilitator Preparation Program.” Ministry and Counsel will write a letter of support to be included in the application. 3. The meeting approved sending a letter of support for Liana Thompson Knight’s training. 4. Tess Hartford reported for Christian Education Committee: a) Christine Bagilieri, our Child Care Provider, had surgery and Jessica Sheldon has been hired as her substitute to provide childcare whenever Christine is away. b) A wreath making activity and pot luck lunch will be held Sunday, December 3rd . c) An advent candle lighting and song will replace the youth story/song in meeting for worship in December. We will not be telling the Godly Play Advent stories as we have the past few years. d) The annual Christmas program will take place on Saturday, December 16th from 5:00 to 7:00. Soup and sandwiches will be provided after a period of worship, and various offerings of songs, poems and stories. The committee requested that an offering that evening be donated to the Lewiston Immigrant and Refugee Center. A snow date will be posted. e) Martha Sheldon reported that the Adult Sunday School Class is reviewing the Interim Faith and Practice section on Membership. A new class topic will begin in January. 5. The meeting approved that a special offering be taken during the Christmas program to be sent to the Lewiston Immigrant and Refugee Center. 6. Youth Minister Wendy Schlotterbeck reported that she continues to work with the meeting youth who are upper elementary and middle school age. Activities include special events for families, for example the upcoming Wreath and decorating party, Dec. 3. The Halloween party planned for Oct. 30 was canceled due to the storm and power outage. 7. The Durham Meeting “Paid Position” ad hoc committee led by Doug Bennett gave a progress report. They stated that their aim is to make proposals to the meeting about how we can be a better, more vibrant meeting. They developed a template showing the functions and responsibilities of the meeting and are considering which of these functions or responsibilities might be better fulfilled by the addition of a part-time position. A list of tasks/functions and groups responsible is attached. Additional responsibilities were mentioned which might be added to the list. Doug reported that this ad-hoc committee recommends a time table: January monthly meeting, present a draft of 3 or 4 alternative models for a paid position, and present a final version of the alternative models for consideration and decision by the monthly meeting in February at which time this committee will be laid down. E-mail your feedback to Doug. 8. 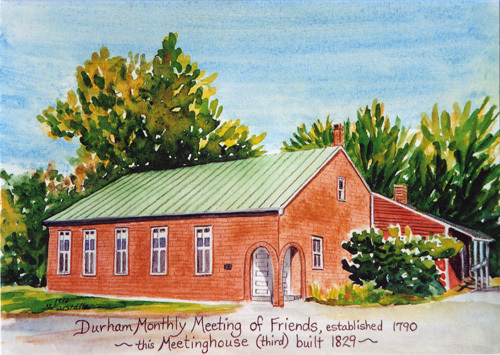 Linda Muller reported for the Peace and Social Concerns Committee: a) Many in Durham Friends Meeting and in the wider community are connecting with folks from other cultures and nations. We are planning an International Welcome Dinner for Friday, January 5 (snow day, January 6). We encourage all connected with Durham Meeting, hosts and exchange students to attend. Invite recent immigrants you have come to know as friends to join us. There will be a sign- up sheet for those attending. b) The committee is concerned as to how they can support those in meeting who are involved in peace and social concerns activities. 9. Margaret Wentworth reported that the Newsletter Committee has reviewed the guidelines for Friendly Notes reaffirming that the Newsletter List is not public; notes should be sent only for urgent reasons, such as: notice of deaths, accidents, or serious illness within the meeting community; previously unannounced special events that will occur before the next newsletter arrives; reminders of very special events; last minute changes; and youth events which need extra publicity. 10. Jo-an Jacobus reported that the Nominating Committee recommends that Margaret Wentworth be added to the committee in the place of Sukie Rice who will be the meeting clerk. The Committee also recommends the following names be approved to be added to the list of committees and officers: Martha Hinshaw Sheldon and Doug Bennett for Ministry and Counsel; Nancy Marstaller for Finance; Nancy Marstaller for Library, Ingrid Chalufour and Brown Lethem for Peace and Social Concerns; Scott Barksdale for Christian Education; Tess Hartford to extend her term on Christian Education for one more year. They recommend that the terms of the following Friends be extended for three years on their respective committees: Margaret Wentworth, David Dexter, and Jo-an Jacobus. A complete report will be made in December. 11. The meeting approved the addition of Margaret Wentworth to the Nominating Committee. It also approved all the other recommendations made for committee appointments by the Nominating Committee. The Minutes will be approved at the December Monthly Meeting.